I’ll admit it. The fact that I’ve allowed this blog to go on for nearly one year without having made a stop in the Europe ’72 tour is darn near reprehensible. It’s a fundamentally critical juncture in the band’s performance history, and a pivotal component required in anyone’s tape collection – criteria that the GDLG uses to guide the selection of most every post anyway. I suppose our coming to it now is some reflection into how my own personal hop scotching around my tape collection has played itself out over the last twelve months. One thing’s for sure: it’s good to be here now. There’s so much fantastic music during this two month run, I have long sat staring at it not knowing where to go first for a review here. There is no denying that this tour marked a certain zenith in creative output by the Grateful Dead. You can hardly go wrong dipping your hand into this cookie jar. Dates from this tour are etched in my mind – shows burned in my brain for their incredible highlights, beautiful sound quality, incredible rarity (back when trading and building a tape collection over years meant something. Gosh, does anyone remember when 05/25/72 finally appeared?). Despite these memories, the entire tour comes to blend together into one enormous adventure. In certain circles there is the persistent rationale that the folks in control of the Dead’s musical archive should simply release an enormous box set containing every note of this tour from front to back. In much the same spirit that the entire Fillmore East run from 1969 was release as one box, here we have another case of sensational music supporting the logic in doing it again. Of course, th Europe ’72 box would be quite a few times larger than anything previously released. Maybe a subscription series would make more sense? Regardless, the Vault holds a vast amount of music from this tour, all deserving of official release notoriety. I have always tended to gravitate to the April shows over the May dates for some reason. So, finally, I have decided to crack open this door and let the light pour in, starting with 04/14/72 at the Tivoli Theater in Copenhagen, Denmark. And just like that, we saw a gem of an AUD come into circulation from Europe ’72 – a tour from which AUD tapes are painfully few and far between. I remember getting this show in the mail from Matt, quite completely out of the blue in 2004, a while after I had dropped out of the trading scene. Fantastic. All things considered, and taken with a hefty dose of caveats, this is a darn good recording. Note that it is by no means “high quality” in the way we have come to think of great recordings out of the early 70’s. There’s a ton of room ambience, boomy (yet wonderfully low) bass, and echoing vocals. It might be hard to appreciate if you haven’t previously raked all the horrendous 1970 AUD recordings over your ears, but this tape really shines, and if there happened not to be one note of this show circulating from the master SBD reels themselves, we could very easily view this tape as a treasured glimpse into a fabulous night with the Grateful Dead. All that said, today we can pick and choose how we want to get our ears around this show, including the inclusion of the gigantic set two jam as bonus material on the Golden Road box set release of the Europe ’72 album. Consistently, the shows from Europe ’72 were hot from start to finish. The band seemed thrilled to be on the other side of the pond, and most shows were charged right out of the gate with strong energy and excitement. 04/14/72 was no exception. Everything from this tour has a charmed quality to it, and even the first sets are beautiful case studies in this wonderful vibe and energy. 04/14/72 is a show well worth enjoying from the beginning. The Bertha finds Jerry in fine form. Vocally, he drives the energy of the band sky high, and everything has an extra added punch. And something worth paying extra attention to here is the Playin’ In The Band. This song saw its own special growth spurt on this tour in particular. It left the states typically topping out at around ten minutes, and ended the tour out at about seventeen, never to shrink back again. The versions in Europe seem to have an exceptionally concentrated flavor to them, and you can hear the full grown monster coming into being the whole way through. 04/14’s version is a glowing example of this. It hurtles itself out into a spiraling, cascading storm of star light and electricity. Within the first minutes of the jam, the entire band trembles near the point of explosion, a wall of pulverizing energy. It then tears across terrain like a lava flow, forever leaving its mark on the evening – this will be no simple rock and roll show. In retrospect, we know the band is stretching its legs here, delivering a wickedly potent spoonful of extreme psychedelia. It permeates the blood, and continues to alter body chemistry, headed for a full flowering in set two. Kicking off the second set, we are treated to another song that was maturing while in Europe: Truckin’. Here, we find the Truckin’ jam picking up where Playin’ left off. 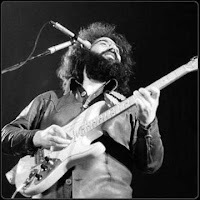 Jerry’s soloing is a wonderful ride atop the song’s up tempo march. Everything blends together with that wonderful growing psychedelic energy which the band would continue to expand upon, eventually using Truckin’ as a launch pad into huge second set jams time and time again in following years. Here, the tune remains a stand alone, wrapping back into a final chorus to finish off the song nicely. It’s impossible not to bring up Looks Like Rain when discussing this show, as Jerry actually played his Pedal Steel for this evening’s rendition. Haunting, yearning, soulful. It’s hard not to wish Garcia had managed to use his Steel more often with the Dead. But, having played in a band myself, I can fully sympathize with how much of a pain it would have been to keep an instrument like the Pedal Steel in tow, set up, tuned, and ready on a nightly basis when it clearly wouldn’t be getting an extremely consistent work out. Regardless, it is wonderful to hear it here, and it sets the stage nicely for the next song. Dark Star begins coiled a little more tightly than one would generally expect. While the phrasing is melodic and singing with a certain gentle lilt, the music is charged with energy – moving quickly from one idea to the next. Just after four minutes, riding along Garcia’s cantering phrases, the entire musical experience gels down at a deeper level, and begins to soar upward. Hypnotic sorcery pervades everything as the music begins to slip and turn liquidly into whirlpools of prism-hued misty clouds which sink, unabated, deeply into the listener’s lungs. Within mere breaths, the music has shed its reliance on time and individuality. Pure musical satori takes over, and there is an unmistakable sense that the music is creating itself. Gentle pockets of angel-like grace appear and recede over and over again, like the soft singing of dew drops on sleeping flower petals. This mystic symphony begins to spread out into fathomless reaches of space, as Jerry gently eases his volume knob up and down. A gorgeous section of give and take between Garcia, Weir and Lesh plays out wonderfully at our feet, followed by the drums re-entering the picture (we hardly knew that had left), and the Dark Star theme returns. Verse one appears seventeen minutes into the song. As we begin to follow a dark wooded path that leads away from the verse, our tether to the ground is loosened slightly. It opens us up to the infusion of a quick paced jam that whisks us across miles of twisted terrain, bobbing and weaving between mountains and trees, under pebbles and leaves, across vast crystal clear lakes with moonlit beds seen fathoms below the surface. The jam turns into the “Feelin’ Groovy-ish” descending four chord jam that would turn up between China Cat Sunflower and I Know You Rider in the following years. It explodes from the heart with a pure white hot joy, singing a rapturous song of love before fragmenting beautifully into a million mirrored crystal droplets of light, all turning slowly in a twisted dance of orbits that grow ever-darker, tinged with red flame reflecting against wet rock. Piercing and groaning, the music defies form, until somehow, as if from a universe we left ages ago, Sugar Magnolia appears. Garcia rides through the song with the same wha wha effect that he was using to dismantle time only seconds ago, and this lends fantastic connective tissue back into the Dark Star we left behind. After his first solo, he turns off the wha, and we are treated to the full blown ecstasy of Sugar Mag, a year or so before it completely formed into a heavy weight show closing rocker. Here, it still flies on its somehow sunshiny, country rockin’ smile that seemed to fade as the mid-70’s took form. Paired with Dark Star like this, we get two wonderful extremes of the Dead at their best. But, it ain’t even over, as Sugar Magnolia slips itself right into Good Lovin’ with Pigpen stepping up to the microphone. In a display that reminds us of one of the most painfully lost elements of the Grateful Dead after the passing of Pigpen, we get treated to the amazingly infectious psychedelic sweaty bluesy romp that always typified Good Lovin’ back in the day. Layer onto this another awesome Pigpen rap, and we have a hallmark Dead moment on hand, made even more precious by the fact that, come the band’s return to the states, this jewel in their repertoire crown would have to be removed with Pig’s declining health and exit from the group. It also must be noted that Bobby’s playing is absolutely incredible on this Good Lovin’. He gets into some phrases and tonal explosions that are not to be missed. The heat continues to rise as the band reaches into a burning energy of music typically associated with their play of 1970. And then we enter Caution. Garcia’s guitar growls its way into the jam, and eventually begins firing off lines like a voodoo witch doctor casting spells. This is another elemental thematic undercurrent of the band at play. This late-era Caution makes it easy to tie together the bluegrass/psychedelic underpinnings that exist within Viola Lee Blues, Cumberland Blues, and Caution itself. As the song drives on, everything dissolves and reforms before our eyes. Pigpen improvises a brief Who Do You Love verse into the fray, and we are then assaulted by hurricane force winds as the music delivers crippling blows to the time signature, while Billy never lets go of the driving beat. 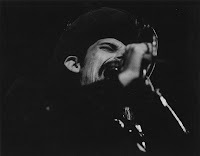 And then there’s Pigpen again, rapping along while the band turns the corner effortlessly back into Good Lovin’, making for an excellent finish. And there’s still more to come. To close things out there is a fantastic Not Fade Away > Goin’ Down The Road Feelin’ Bad > Not Fade Away with a tight little China Cat Sunflower jam tuck in there for good measure. Not Fade Away stomps along in its standard rocking fashion, eventually spreading its arms wide into the light shuffle that ushers in Goin’ Down The Road. Bobby offers up his China Cat lick, and Garcia chimes in on guitar with a lovely take on his own vocal line. It gloriously slides into Goin’ Down The Road, and nothing could feel better. Here we are steeped in the very essence of that Grateful Dead Americana Folkloric Psychedelic music that so epitomizes the band across the years. As the solo sections mount, Garcia absolutely beams with light and showering energy. Not Fade Away returns and the rafters shake as the set comes to a close. Bobby, steps to the mic and tries to introduce the encore, but can only manage a mumble. The band laughs and rocks out One More Saturday Night to end the night. 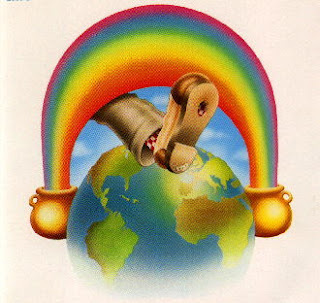 Whether you choose SBD or AUD (or both), you’re sure to enjoy this visit to Europe ’72. thanx for this superb review. europe 72 has probably always been my fave GD. Partly as i am European and also as I picked up some vinyl boots of this tour back in 74/75 and it was my first intro to the wonderful world of the Dead. It would be a great idea that BOX of the tour as there is still a couple of dates that I haven't managed to get SBD's of tho' I know that certain people DO have them!!! Thanks for reviewing Europe '72 show -- I love 'em. A highlight of them is hearing both Pigpen and Keith Godchaux on keyboards. Maybe Pig got inspired by Keith's honkytonk energy and technical skill, or maybe it was being in Europe, or something else. Whatever is was, Pig's keyboards are more present and musically involved than anytime since '70 or even '68. And Pig just naturally slipped into the right sound for the new lineup. His sound is thin, whistling, atmospheric -- a background wash that still lends a great rhythm to the proceedings. While Keith is at his full-bore honky tonk-inflected best. Keith was so talented in music theory terms, and the band was really relying on him during these shows as a grounding influence ... and when the train threatened to careen off the tracks, to deftly sound a touchstone to steer it back on course. The soundboard mixes are great too. The best ones have a vast amount of space and air between the players -- there's a lot happening and there's plenty of room to hear it all. Looking forward to more Europe '72! Thanks for another fine write-up, noah. I never knew about this aud and am getting a kick out of hearing it. 72 is the perfect year for me. It tops all others, including 73 and 77 (though 73 is damn close!) and I will never tire of these shows. there is something timeless and profound about these shows that cuts through to the infinite form consciousness of the universe- the joy of being made manifest as sound. I dunno, is that a little too much praise? Not to be pedantic but the video is actually from 17-4-72 also in Tivoli and filmed by Danish televison. By the way I was there (14-4) and is certainly was a magic evening. I have to ask because I am "slightly" desperate - are there any more auds from the Europe '72 tour? I lucked out and found 4/29/72 shn 5250 (and it's a good one) on gdaudcast, but that's it. They can't be the only ones. ... I mean, they very well could be, but that would be tragic, and I want to believe. Anyone know why Donna was not at this show? I remember having a decent sounding AUD tape of this show in the late 80's.